Manufacturer & Supplier of Live Vertical Garden. Our product range also comprises of Railing Planter, FRP Planters and Stainless Steel Planters. 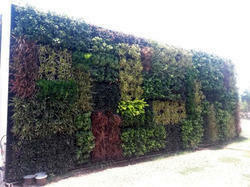 We are a leading firm offering Live Vertical Garden to our clients. These are made using elements of nature and design, to create a garden truly one of a kind. We make clients to chose the deigns and patterns so that they can get the garden of their dreams. Recycled material that provide long lasting usage is used in the manufacturing of the product in order to satisfy the expectatiosn of our clients. Also the price range we offer is budget friendly.